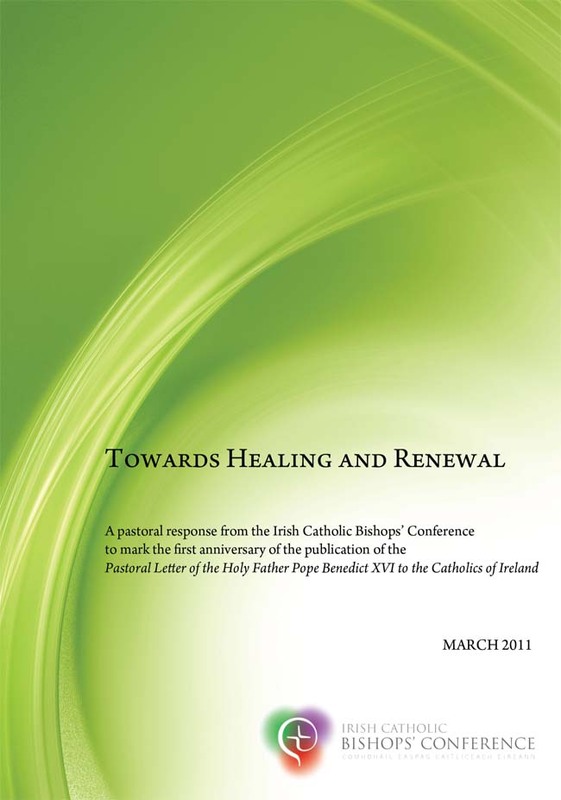 To mark the first anniversary of the Pastoral Letter of the Holy Father Pope Benedict XVI to the Catholics of Ireland, published in March 2010, the bishops of Ireland have launched a pastoral response entitled Towards Healing and Renewal. Its contents represent part of a wider response and longer journey by the Church in helping to bring healing and peace to survivors of abuse. The accompanying press release can be accessed here. 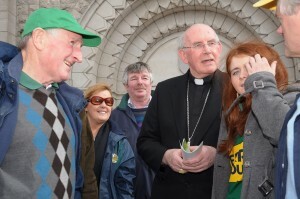 Cardinal Brady distributes copies of Towards Healing and Renewal to parishioners after Mass in St Malachy's Armagh, 20 March 2011. On 19 and 20 March 2011, to coincide with the first anniversary of the Pastoral Letter of Pope Benedict XVI to the Catholics of Ireland, the Bishops’ Conference published a ‘Pastoral Response’ to survivors of child sexual abuse by some priests and religious entitled Towards Healing and Renewal. This pastoral response follows the publication of the resource leaflet, Friday Penance, which was launched in November 2010. Along with the grievous wrong of abuse, for many survivors their faith in God and in the Church has been profoundly damaged. Many have expressed a hope that the damage to their faith can be addressed. Towards Healing and Renewal outlines the commitment of the Church in Ireland to healing and renewal and the steps on this journey pointed out by the survivors of abuse and their representatives. These steps are elaborated more fully in the bishops’ pastoral response. Importantly, this short publication also mentions ways in which parishes can play their part in assisting the process of healing for survivors of abuse. Cardinal Brady is interviewed after Mass in St Malachy's Armagh on 20 March 2011. Irish Missionary Union launched a new Catholic counselling and support service, for survivors of abuse, called Towards Healing. This counselling service, which continues the important work of Faoiseamh, offers survivors a professional and caring environment by providing a wide range of support services. The normal opening hours for the Towards Healing service are: Mondays and Wednesdays, 11am to 8pm and on Fridays 11am to 4pm. Its freephone helpline numbers are: from the Republic of Ireland 1800 303416; from Northern Ireland and Britain 0800 0963315. The first anniversary of the publication of the Pastoral Letter of Pope Benedict XVI to the Catholics of Ireland occurred on 19 March 2011. 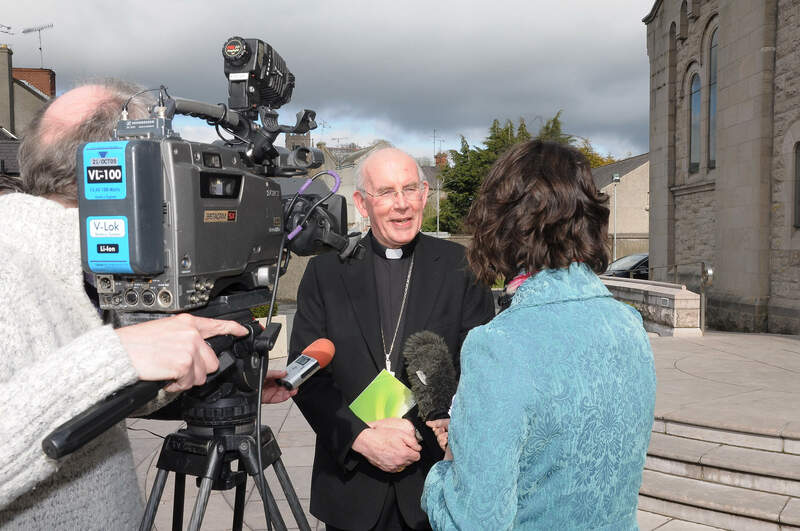 To mark this anniversary Irish bishops wish to bring the following three important initiatives to the attention of the faithful: the publication of their pastoral response Towards Healing and Renewal; the new Catholic counselling and support service for survivors of abuse; and, the progress of listening and consultation exercises which have been taking place. In February 2011 bishops, the Conference of Religious of Ireland and the Irish Missionary Union launched a new Catholic counselling and support service. This counselling service, which continues the important work of Faoiseamh, supports survivors of abuse in a professional and caring environment by providing a wide range of services, including Helpline and face-to-face Counselling. Healing Meetings, Group Work, Practical Workshops and a Social Worker/Bridging service designed to link survivors of abuse to other services relevant to their needs, such as the health, local authority, educational and social welfare services.